Register now for our Summer Day Camp, happening from July 8 to August 23, 2019! 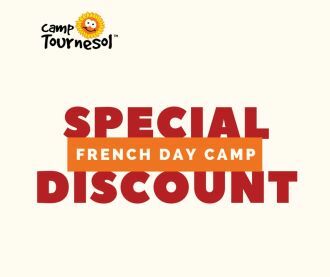 And enjoy our MULTIPLE WEEK DISCOUNT* if you register for 3 or more weeks of French immersion day camp at the same time (whether it is one camper for 3 weeks OR 1 camper for 2 weeks and a sibling for 1 week). You will receive a 4%* multiple week discount on the program fee. We offer educational French-language day camps designed to enrich French verbal skills through experiential learning. Children will learn to express themselves with a richer vocabulary and complete sentences while participating in fun, exciting and engaging activities. Don’t delay! Secure your spot NOW!